A breakthrough field application developed by Saudi Aramco scientists, researchers and engineers will help preserve the Kingdom’s precious groundwater reserves during water intensive hydraulic and acid fracturing jobs. Hydraulic and acid fracturing treatments involve the use of relatively large volumes of groundwater. The fracturing fluid incompatibility and flow assurance issues of seawater has prevented Aramco from using it as an alternative to fresh, low so-called toal dissolved solids (TDS) groundwater currently being used in hydraulic fracturing operations. A major challenge of using raw seawater instead is maintaining a viscosity comparable to the one generated from fresh water-based fracturing fluids. This viscosity is important to create the fracture and carry the proppant particles that keep the fracture open. 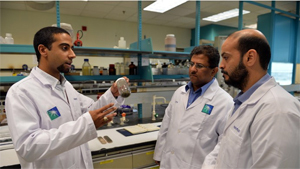 Aramco research teams have now designed the company’s first raw seawater-based acid fracturing treatment, utilizing the in-house developed seawater-based fluid. Results of this research and the first field application concluded that seawater is a reliable and compatible alternative. The challenges were resolved through extensive research studies and recently the first acid fracturing job was successfully carried out with fully functional in-house developed seawater-based fracturing fluid. Besides pursuing innovative and cost-effective solutions to operational and environmental challenges the improvements are well aligned with the company’s water conservation policy.